Did you L.O.V.E. the week of giveaways?! Me too. If you haven’t entered yet, you still have time! Thanks to all of the FABULOUS sponsors for their fun prizes. 4. Hot glue the end of a new piece of yarn to the back of the wreath and wrap around the wreath, crossing over each of the felt hearts on the diagonal. (Don’t be too picky or you’ll be there all day. Am I right, or am I right Michelle?) When you get all the way around your wreath, cut the yarn and glue the end to the back of your wreath with hot glue. Not only am I happy how the wreath turned out, but I had so much fun crafting with Michelle while our kids played (again). Check back next week for giveaway winners and more fun Valentine’s decor! Hi Kara!! I love it! I have always been a fan of Argyle and truly never thought to use a heart in place of the diamond! My linky party will be up tonight for tomorrow. Check it out if you would like to link this up. SweetTalkin’ Sunday!! Such a cute wreath! I love the argyle look! Fun, fun! Super cute, Kara! I’ve been waiting for you to share this since you showed the sneak peek on FB. :) I love it! That’s SO CUTE!! I want one! I. LOVE. ARGYLE! Seriously, this wreath is SO adorable! I’m putting it on my to-do list for today! I LOVE THIS! This is so very cool! I’ve pinned it I hope that’s okay! I am TOTALLY making this! Love it! Cute blog! I will be back! Do you have any advice for wrapping the yarn? I’m trying to make the argyle wreath, but I’m having a problem with my yarn being on an angle. Since the wreath is a circle, the yarn is closer together on the inside and there are gaps in the yarn on the outer edge. Love this idea! I have extra darker gray yarn just perfect for this project! Such a cute idea and easy! Thanks for sharing! SOOOO glad I found your blog! Cutest. Valentine’s. Wreath. EVER! Thank you for sharing!!!! Awesome! Simple and classy; love it. So cute! I want to make one! What size wreath did you use? Do you have the template for the hearts? Can you tell me how much gray yarn you used? Do I need to buy a few rolls? Thanks! Very cute idea! With that subdued grey yarn it looks very elegant and not too valentine-y! This looks so CUTE!! I do have one question though, how much yarn did you use to cover it all? I just made one of these. So easy! I bought a big roll of yarn (2 sceins) at WM for $3.88 and used about 2/3s of it to cover a 14″ straw wreath. I made one if these!! It was so much fun and turned out beautifully! Thanks for the awesome tutorial! I just finished making this and it’s very cute–I love it! –I used a 12″ foam wreath form, simply because that’s what I was able to find. –I ended up with 14 hearts, and my heart pattern was about 2″ x 2″. –Don’t underestimate the tediousness of wrapping yarn around the wreath. Do it while you’re watching shows or a movie or something. That part took about an hour and a half. –I bought a thing of cheap-ish yarn from the craft store and it was MORE than enough (Red Heart Super Saver brand, 244 yards-I used maybe a quarter of it.) If you can find a smaller thing of yarn, you’ll be just fine, but that was the most economical option for me. I so loved this I had to do it right away. I’m not quite done yet but I used a old pool noodle held together with some rolled up cardboard. It looks amazing! I am in love with this! Now I need to find the time to make it. Thanks for the tutorial. I loved making this… it was so much fun. I would recommend getting a thick felt. My light pink hearts showed the glue through when I glued them to the wreath. I might just double them up. I also used pinking shears on my hearts which turned out cute! Thank you for sharing this fabulous idea! Very cute. I love the argyle look. Thanks for sharing. 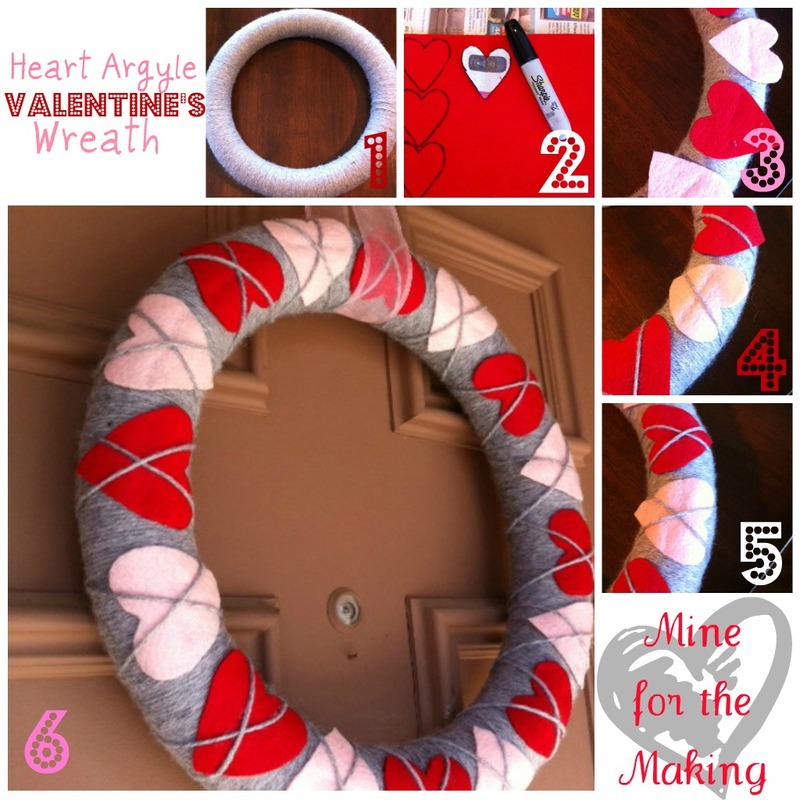 That is such a great idea to use hearts as “argyle” for a Valentine’s Day wreath! It looks fantastic!